Uninterruptible Power Supplies are usually something hidden under a desk. Sure, they can save your bacon during a power outage—providing precious time to save your work and shut down your Mac gracefully. Unfortunately, they are generally boxy and bland and best kept out of sight. iDowell’s line of Italian designed UPS products, however, look so good, you’ll want to keep them on top of your desk. 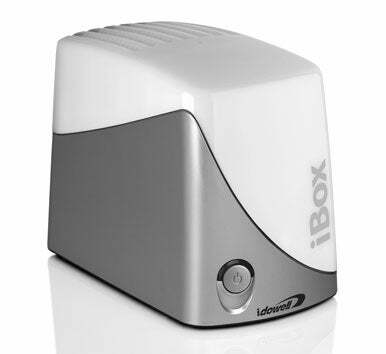 The iBox, a $250 UPS, is a great fit for the iMac and will keep you up and running for at least 15 minutes in the event of a power failure. The iPack is a little larger and meant to keep a Mac Pro working during a blackout. The iPack’s battery will last up to 10 years and includes two extra outlets for your display or other peripherals. The company touts their products’ Eco-efficiency claiming to use up to 75 percent less energy than competing UPS products. Also check out iDowell’s Mac mini-inspired iPlug surge protectors that feature four outlets and should be available in the US in about 6 months. The company is also showing its new Portable USB Battery Charger, a $45 unit that you can recharge over USB and then use to charge up your iPhone or iPod when out on the road.